The Greeks are wise as these Greek quotes will show you. They’re also really funny. When I think of Greece, I think of dreamy islands and brightly blue painted doors. I didn’t think of road tripping. But now, having done it, I highly recommend it. 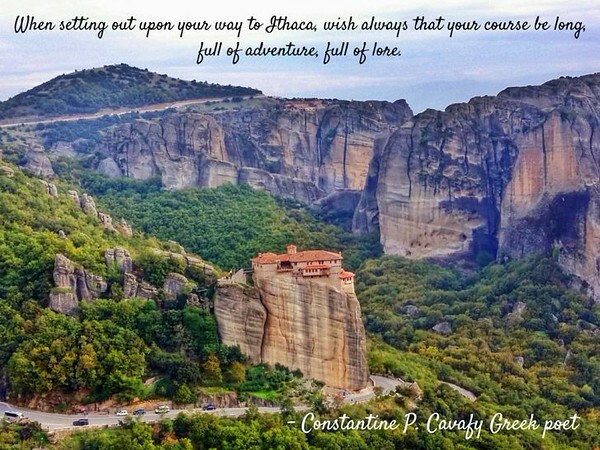 Leaving from Athens, our first stop was to Meteora, home to adventure-seeking monks. That was followed by several days in Epirus. It’s a region in northwestern Greece that is home to over 2000km of hiking trails and bears! Yes bears in Greece! Epirus is famous for its’ villages. Kallarytes, a village on a mountainside, consisting of just 15 houses was one of my favourites! Rather than returning the same way, we headed south. , since no trip to Greece is complete without a visit to the crystal blue waters that Greece is so famous for – that’s where Parga comes in! No trip to Greece is complete without a visit to the crystal blue waters that Greece is so famous for – that’s where Parga comes in! Now a road trip wouldn’t be complete without some tunes, which I’ll leave to you, but I’ve got something even better for ya. Greek quotes, most from our very knowledgeable and hilarious guide Sophia. As travellers know, connecting with locals and really getting a feel for a place enhances travel so much more than just sightseeing. These Greek quotes will give you a feel for the real Greece and for how Greeks think. WARNING! You’ll never be able to say It’s all Greek to me again! OPA! Meteora, where monks live in monasteries on seemingly suspended sandstone cliffs. Dodoni Theatre, the most significant archaeological site in Epirus, dating back to 4th century B.C. One of ~74 stone-arched bridges found in Epirus that connect the villages in the mountainous region. The beautiful village of Parga. Let me know your favourite Greek quote in the comments below. Previous postYala, Sri Lanka: Home to the Best Leopard Spotting on the Planet! ahhh Sophia so full of knowledge. So hilarious at the same time. What a great trip! @Megan - Yep, that describes Sophia perfectly! Fun hanging out with you guys! From what you've posted and I've seen from other friends Greece is definitely a place I need to make it too. Nice quotes as well. Hi there. These are amazing pictures from my country. I two like and write about outdoors and adventures in my travel blog and I have visited all the places you mention. Next time drop a line... We may have some interesting suggestions for outdoors! Have a great day. @Chris - Thank you! Yes, I will let you know the next time I visit Greece. I definitely want to go back. I love this! Some are definitely going to my pinterest. @Mike - The pizza one is my favourite as well! Beautiful photos of GREECE also interesting blog. If you want to see the most beautiful islands of GREECE I recommend Ionnian islands , we have the most beautiful beaches .